Beyond the limelight and chorus of approval for Tamiya's superlative new 1/48th scale Zero 52, the latest markings incarnation of Hasegawa's respectable 1/72nd scale 52 provides for two machines flown by legendary IJN ace Tetsuzo Iwamoto. '53-104' of the 253rd Ku flown from Rabaul in 1944 with two variations of splendid cherry blossom victory markings emblazoned along the rear fuselage and the plainer '252-114' of the 252nd Ku flown from Mobara in 1945. Whatever one thinks of Hasegawa's marketing policy of re-releasing the same kits with different box art and decal options a useful aspect of this kit is that you get spare spinners, back plate and prop blades which can be used to improve older models. An odd thing is that the painting instructions depict the wooden drop-tank with fins, more representative of the 52 (? ), but the kit only provides the earlier metal version. Pity. Hasegawa can't decide whether the Rabaul tail markings were white or yellow, so provide both options. They are not alone. My choice would be yellow. When the Academy 1/72nd scale Mitsubishi A6M5c was released in 1998, it was scorned by some reviewers. However, there is a superb build of this kit here that is well worth a look and certainly redeems this underestimated kit. The colours are well chosen - especially the prop. I always felt the detail on this kit was actually superior to Hasegawa's version. The same forum features a very nice build of the lovely ICM 97-Sen by Canadian decal guru Mike Grant, which vindicates the Ukrainian company's innovative approach to the engineering of the kit. The September issue of Scale Aviation (Vol. 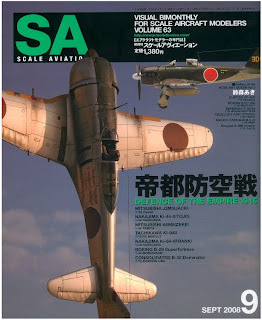 63) is chock-full of interest for Japanese aviation enthusiasts. For non-Japanese readers the text is of limited use but there are English captions here and there and the images are beautiful. The main theme is the Defence of The Empire 1945. Check out Rogan Umemoto's model of a fatally wounded Hayate pilot being carried above the cloud base to Valhalla by a Valkyrie! Imaginative aircraft and figure modelling in 1/48th scale, making use of Model Kasten's super little set of Japanese aircrew. Let's have more sets like these from manufacturers please, especially in 1/72nd scale! Fujie F Satake's Revell 1/32nd scale Raiden (Jack) demonstrates just how good these Revell (Japan) kits were in their day. This issue also contains some interesting sketches of Raiden details, including that oblique-firing 20mm cannon. Tamiya's new 1/48th scale Zero 52 is expertly put together by Shinichiro Wada. His rendering of 'aotake' is impressive and the colour choice for the cockpit raises the bar in realism. Ko-zaburou Nagao reprises an old favourite with ace Yoshio Yoshida's gleaming Shoki of the 70th Sentai using the Hasegawa 1/48th scale kit. RS Models huge 1/72nd scale Ki-94 in spurious 244th Sentai markings by Koichiro Kanome goes up against B-32 'Hobo Queen'. In another colour photo-feature the "Wiriam Brothers" (!) 1/32nd scale Seversky P-35 becomes the Asahi two-seater J-BAAN, long overdue in 1/72nd scale. There are some interesting 'then and now' aerial photographs of some of Japan's famous air bases and to round it off a charming cartoon of Toryu (Ki-45 'Nick') by the talented Noburo Shimoda.